The latest animated Mr Bean DVD is out and you can win a copy! Mr Bean is a worldwide phenomenom. Two movies, 14 classic tv episodes and an appearance at the London Olympic opening ceremony have cemented Mr Bean’s place in comedy history. The animated Mr Bean series launched in 2002 and, 106 episodes later, Rowan Atkinson’s character is finding a new generation of fans. A new release, Superbean, is launched on Monday 30 January 2017 for the ridiculously low price of £6.99. In this collection, Mr Bean (voice of Rowan Atkinson) dresses up as a superhero to try and catch a burglar, creates his own golf course and tackles an out-of-control robot! 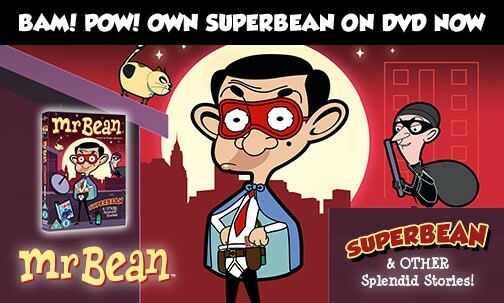 One lucky winner will win a copy of Superbean on DVD! Simply enter using the widget below by Sunday 5th February at midnight. Good luck! 1. Closing date is 5 February 2017 at midnight. 2. The prize is a Mr Bean Superbean DVD. Next post Craft Metropolis - Beer for Valentine's Day! Mr Bean – he is so funny! Mine has to be Mr Bean as he he so funny, and makes me laugh. Without a doubt Mr Bean. Roman Atkinson is a legend in all his work but there’s something extra special about Mr Bean. Blackadder, especially the sarcastic butler. Mr Bean! I used to have a standing joke with a friend of mine where I would pretend to be him (we were about 10) – I still have absolutely no idea how it came about, but it lasted for years! It has to be Mr Bean. I am so glad my young daughter finds him absolutely hilarious too, love seeing her giggle and rolling her eyes at his antics! My favourite Rowan Atkinson character has to be Mr Bean. My daughter loves Mr Bean so fingers crossed! My favourite Rowan Atkinson character is Mr Bean. Mr Bean without a doubt, especially his awesome dancing! We love Mr Bean ???? I love Rowan Atkinson, he is an incredibly versatile and talented actor. My favourite character is as the French detective, Maigret. Blackadder in Blackadder Goes Forth! Oh, he is utterly brilliant in Blackadder so that is my favourite. It has to be Mr Bean – I watched it loads as a child! mr bean is my favourite .